Meanwhile back at the ranch | Everything Mayo! This oddest of summer storms shows no signs of waning, with no clarity as yet on what’s going to happen in relation to Saturday’s Round 3 qualifier against Kildare. This piece in the Leinster Leader (here) suggests that Kildare GAA are preparing to concede the tie but then push the nuclear legal button. Cian O’Neill, meanwhile, seems to have been told to get back to work. I wish some of you lot would too and leave me in peace for a while so I could concentrate on work issues for a bit as well. Anyway. I thought it might be good – for the Mayo GAA fans (now in the minority here on the site, if the tsunami of web traffic and the range of comments on the blog since yesterday are anything to go by) among you – to provide some Mayo GAA news. Bread and butter stuff. The rest of you can sling your collective hook. First, ref news. This assumes there will be a match played on Saturday but if there is then David Gough will be the man in charge. The last time he reffed a championship game of ours was last year’s All-Ireland semi-final replay against Kerry but he also officiated at our opening League game this year, against Monaghan up at Clones. Next, the bad news. It was confirmed this morning that Seamus O’Shea had keyhole surgery on his shoulder yesterday and so any hopes that he might be back this summer have now been eliminated. A piece in The 42 (here) speculates that Seamie could be out for up to ten weeks, while Mike Finnerty in today’s Mayo News (paper and digital variants) reckons he’s gone for at least two months. No matter how you cut it, that’s him out for the summer, which is a crying shame both for him and for the team, not least given Tom’s bad injury too. At times like this, you’d feel we’re uniquely disadvantaged – cursed, even – but, even though we’ve suffered a rather horrendous run in that area this year, we’re not alone. News broke today, for example, that Donegal’s Paddy McBrearty did his cruciate during last Sunday’s Ulster final so that’s his summer of football over with too. It’s also a heavy blow for Donegal to lose such a talented forward, just after booking their place in the Super 8s. Sport really can deliver the cruellest of blows sometimes. 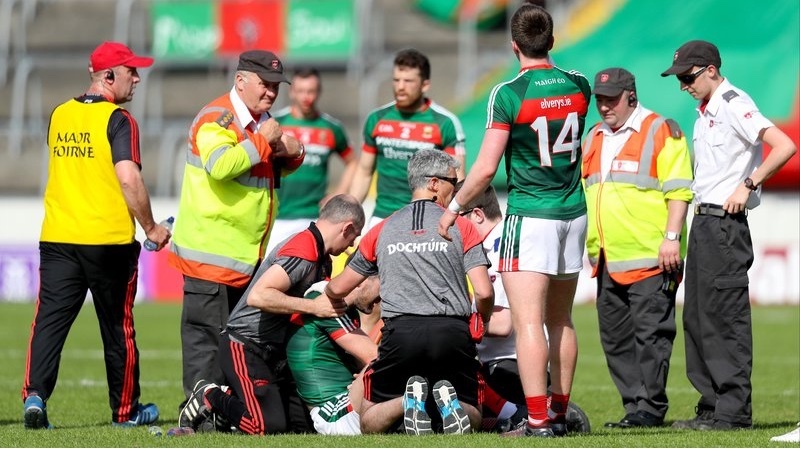 Back to us and back to that Mayo News piece where Mike reveals some positive news on the injury front. Brendan Harrison is finally ready to resume full training and could well be in the frame to be included in the match-day 26 the next day out (whenever and wherever that may be). Harry hasn’t started for us since the League match against Kerry back in February (he came on as a sub against Galway in May) and we could really use his nous and experience back in our defence. In the same piece, Mike also reveals that Castlebar Mitchels trio Barry Moran, Neil Douglas and Donal Vaughan are fit once again and ready for selection for the next game. There’s loads more in the paper this week, by the way, with Billy Joe Padden’s tactics column and Ed McGreal’s drill-down on the numbers, while Danny Carey – with whom I travelled down to Thurles on Saturday – has a great On The Road piece. Sean Rice’s column is great too but my eye was immediately drawn to the bit in his piece where he says that, after Thurles, for us “the welcoming bosom of Croke Park awaits.” Jaysus, don’t mention the war. The post Meanwhile back at the ranch appeared first on Mayo GAA Blog.